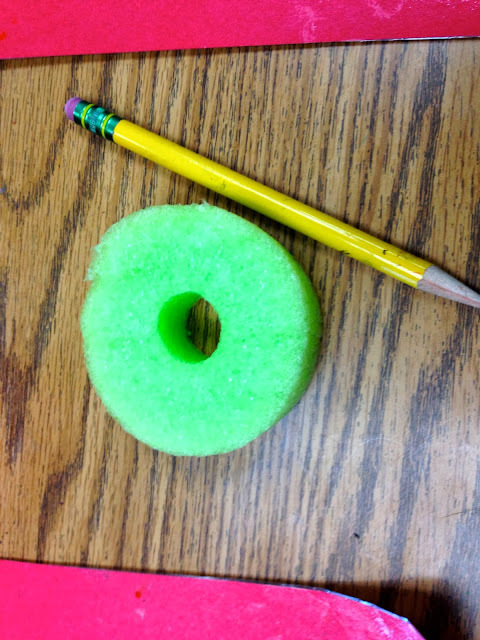 Teaching Blog Round Up: Oh, The Things You Can Do With A Pool Noodle! Use Pool Noodles to create pumpkins! I sliced off a piece of a pool noodle and we used it as a stamp to stamp 5 orange circles on our gate. It was the 40th day of school, so it was perfect since it looked just like an orange zero! The pool noodle also created a nice texture when we lifted the paint up off of the paper. 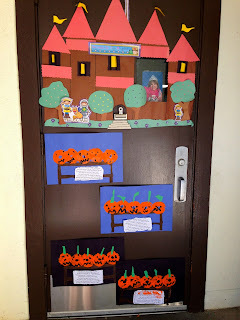 The students cut out a simple gate which was printed on brown construction paper. You can also just give them 2 long strips of brown construction paper (1" X 10") for the gate rails and 2 short strips (1" X 5") for the gate posts. These mouths looked a lot like Ws. We poured a bit of orange tempra on a paper plate and used the slice of the pool noodle to dip into the paint and stamp five pumpkins on the gate. You can also paint the orange paint onto the pool noodle slice before stamping. The next day, I gave each child 5 wide mouths that kind of looked like wide Ws. I made them by stacking 5 pieces of black construction paper cut to 1/2" X 2". I trimmed the sides so the rectangles looked like trapezoids. Then I snipped out two triangles from the top and one from the bottom. Some came out a little wider with 3 triangles cut out of the top and 2 out of the bottom. These mouths looked wider than a W.
Black background meant it was nighttime. I placed the 5 "W" shaped mouths and all of the scraps of triangles on each child's workspace. They glued the mouths to each of the dried pumpkins and had lots of triangles to create eyes and noses. I also gave them each a small piece of green construction paper to create five stems or vines. The entrance to our "TK"
They also got to glue the poem to the gate. 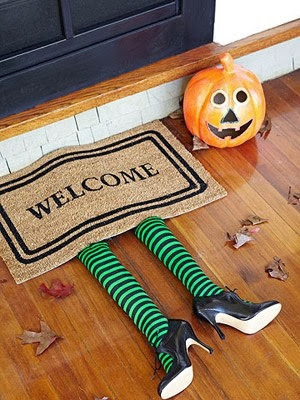 Don't they look cute on and around my door? I still have the rest of the pool noodle to use for other great projects. 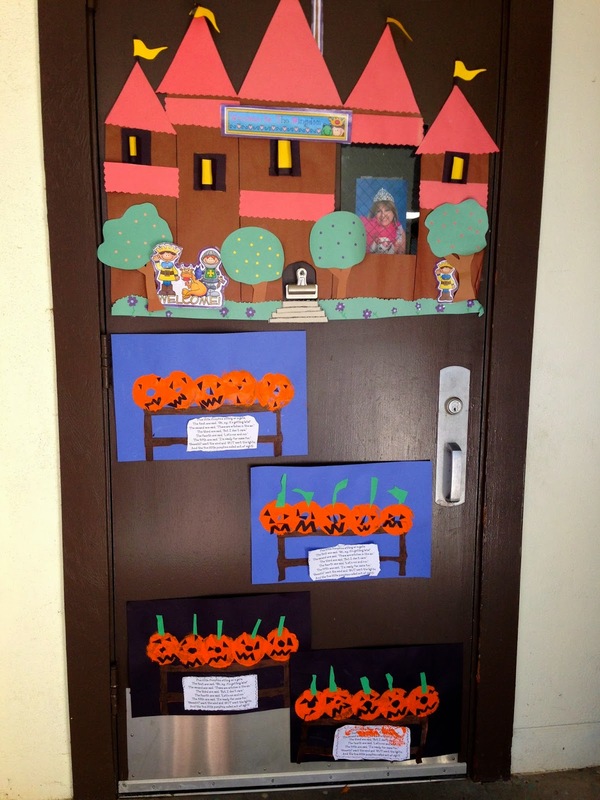 If you made "5 Little Pumpkins Sitting on a Gate," let us know how YOU did it! A Halloween Color-word Book where students copy the names of the colors and color the pictures to match the color words. This makes a great "take-home" book to read to their families. 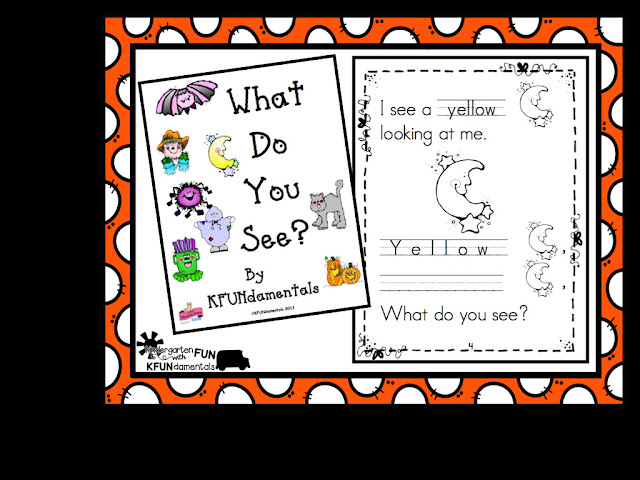 Click the image to grab this cute book for students to make. 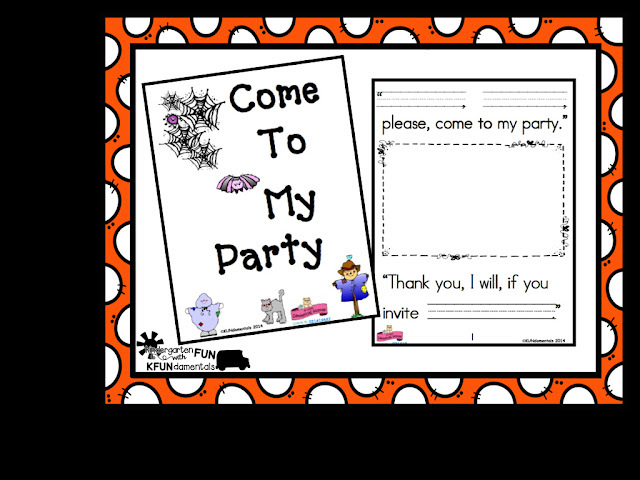 A Halloween Circle Book: Your students copy and write the characters they want to come to their Halloween party. Click the image to grab this cute circle book where your students can add their own characters.